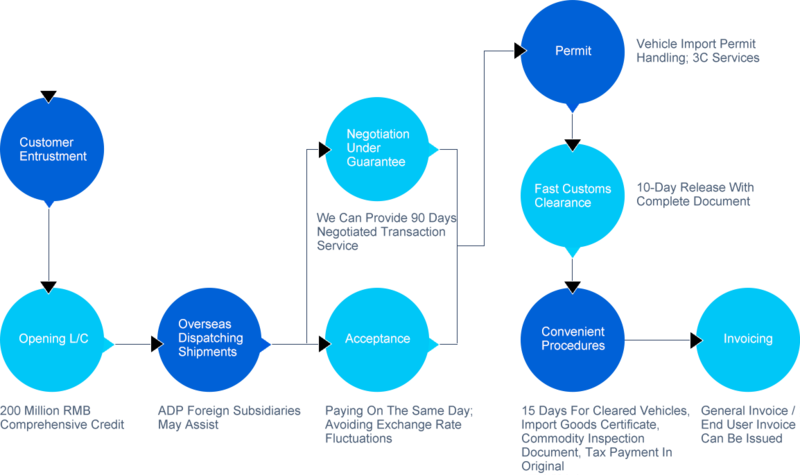 ADP provides one-stop supply chain services for imported automotive customers under LC transactions: opening L/C, import, logistics, customs clearance, invoicing etc. In the major vehicle import ports of Shanghai, Tianjin, Zhangjiagang, we are equipped with branch offices, and provides the following services: loading, unloading and stacking, testing experiments, display and transactions, vehicle and parts distribution and modification, financial services etc. ADP has a full set of car sales, invoicing, licensing and other qualifications, and has more than RMB 200 million bank credit. Clearance can be completed in 10 business days with complete documents. ADP also provides ancillary services: Import agent, issuing sight / usance L/C, customs clearance, commodity inspection coordination, warehousing, distribution, invoicing and so on.